Flights: Southwest, came to $100 roundtrip. Car: Budget, Chevy Cobalt. Not what I really wanted but it was acceptable. Less tinny than I remember at least. Hotels: just grabbed whatever I could find, all were acceptable without being anything extra. All had internet access so I was able to stay on top of things. From December 2nd to 6th, I spent some time poking around the Mid-Atlantic. Not going to do an extended trip report, but here’s a brief overview. Thursday 12/2: Early flight from Boston to Baltimore (Southwest). Nothing to it, 1 interesting raptor on the runway at Logan. Picked up the car and headed for New Jersey, stopping at a Popeye’s on the way (for future reference, asking for 3 pieces doesn’t mean 3 strips but 3 huge pieces of chicken). Reached Cape May midafternoon and drove around a bit. Was rather cloudy and cold looking, so didn’t bother getting out to walk anywhere. Eventually went north to Avalon and then found a hotel somewhere nearby. Bought some roast beef from a supermarket for dinner (and lunch). Friday 12/3: Started by heading to the Avalon Seawatch. It was just me and the counter for the time I was there. Very impressive with tons of Red-throated Loons, gannets, and scoters going over. Also nice was an Oystercatcher going north and Purple Sandpipers on the rocks right in front. It wasn’t brutally cold, but enough that I didn’t bother with any photos. The count report from the day is online. After leaving midmorning, I attempted to stop at an ATM. For whatever reason, it didn’t work, which would cause issues later. I headed to Cape May, where I stopped at Higbee Beach WMA for a short walk. 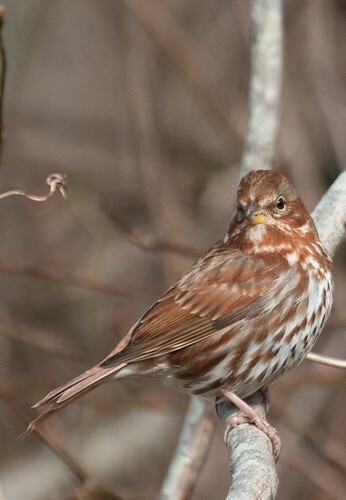 Sparrows were all over including several Swamp and a nice Fox. Also had a bunch of Hermit Thrushes and a few waxwings. From here, I headed to the hawk watch platform at the state park. After eating lunch, I wandered up to look at the pond (the hawk watch was over for the year and I had the place to myself). Lots of wigeon and shoveler with a few other ducks. I decided that it was time to head for Delaware. Probably should have just taken the ferry, but I decided to drive the long way around. Given that I still needed cash and was also starting to get low on gas, I eventually pulled off the highway more or less at random. The main road was under construction with barrels all over and I was paying too much attention to them. Up ahead was a red light that I didn’t see until a split second too late. Luckily both cars had only minor damage and everyone was fine but waiting for the police and stuff took an hour (plus the cost of the ticket and whatever is going to happen with insurance). I reached the gas station and atm and then got back on the highway and headed onward. One Black Vulture on the way was nice, as was getting a taste of the blackbird flocks near Odessa, Delaware (tens or hundreds of thousands over the highway, would have been nice to have stopped and watched them land). I eventually reached Rehoboth Beach where I found a hotel and grabbed a salad from the McDonald’s next door. Saturday 12/4: Checking reports in the days before, I saw a post about a Sussex Bird Club trip in the area. Figuring locals would know more than I would, I immediately decided to join them. Other than a lack of introductions and a brutal wind, it was a fun day. We birded from Indian River Inlet to Cape Henlopen State Park. The club report is here (although if they weren’t too busy with the Black-headed Gull, they might have noticed that the egret was a Snowy). 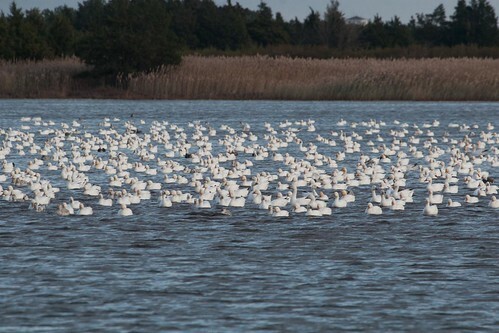 After the walk ended, I headed to Prime Hook NWR. I wandered a trail at random and enjoyed the Snow Geese going overhead and a Winter Wren. 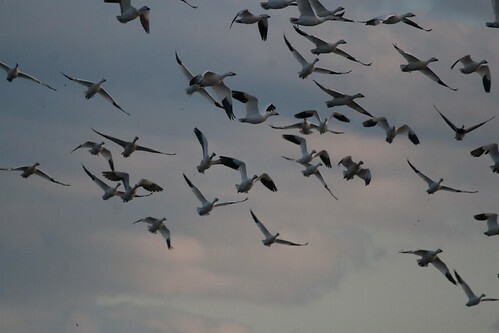 I then made my way over to Broadkill Beach Road, where I sat and listened to the Snow Geese for most of an hour (guess I should have actually looked since there were Ross’s in there). Then it was back on the highway north, where I found a hotel in Dover. Dinner was at the adjacent TGI Friday’s, surprisingly good. 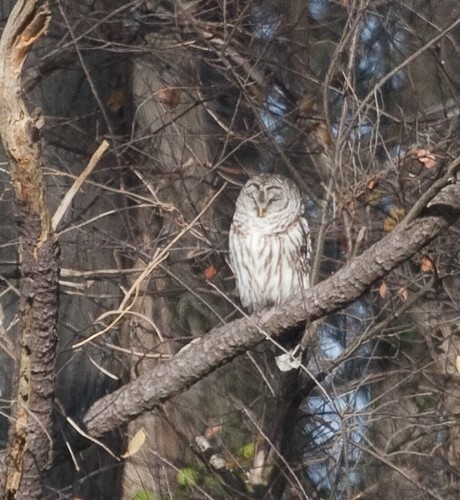 Sunday 12/5: Today I headed to Bombay Hook NWR. Arriving pretty early, I read the sign as you turn in to watch for foxes. I rounded the corner and immediately had to dodge one! I started to slowly drive around but after noticing many of the geese leaving, I sped up a bit to get to a view of the pond before they all left. 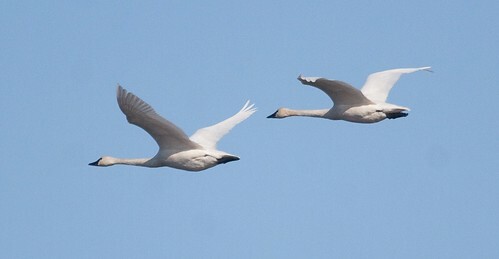 At the pond, I was a bit late for the geese, but my main target of the trip was around, Tundra Swan. There were a couple dozen at least along with a large variety of ducks, a bunch of avocets, and some shorebirds way off in the distance. 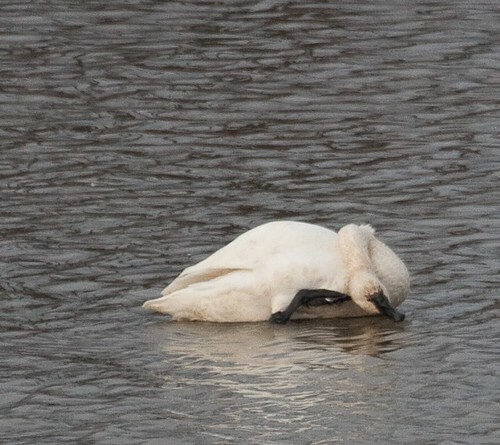 After spending some time studying the swans, I moved on and walked the next trail. It was too windy for anything on the marsh, but I flushed 3 egrets (2 great, 1 possibly smaller) from the trees and had a Rusty Blackbird. Continuing on, I rounded the corner for another view of the pond when a Snow Bunting flew by. I got closer to the shorebirds and began to study them. Marbled Godwits were obvious and I eventually sorted the smaller ones into dowitchers and a few Greater Yellowlegs. That left one largish, pale bird. I presumed it was a Willet but after seeing Hudsonian Godwit reported I’m unsure (it slept the entire time or it would be easy). Full size makes it easier to see. I count 9 species in the photo, can you find them all? A similar shot is available, with a slightly different mix. After having the Snow Bunting fly by again, I continued on to the Shearness pool, which had similar numbers of waterfowl (and some flyby Tundra Swans and a Bald Eagle). Back at the Shearness Pool, I found a large group of small sandpipers. 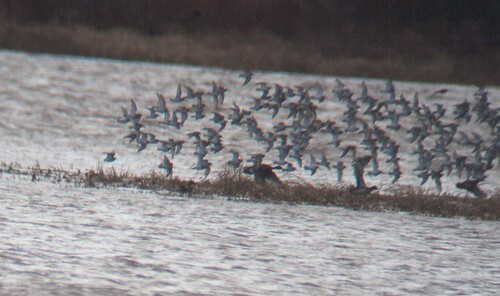 Called them Western at the time but Dunlin makes more sense. It was way too windy to get out, but I did manage to prop up the scope in the frame of the door. From here, I looped the other pool again (geese were back but nothing good among them) and then headed out. Stopping at the visitor center for a bathroom break, the White-crowned Sparrows at the feeders were a nice surprise. From here, I drove down Port Mahon Rd where I found a few Dunlin but not much else. I then drove up and down a bit, finding a Killdeer and not much else. It was far too windy to get out anywhere, so I gave up and went back to the hotel and watched football. I decided to get a sub for dinner, looked up a place online, drove over and ended up finding a different one. For some reason, they only had part of the menu on display, so I got a meatball instead of the steak I planned on. A little different. Monday, 12/6: I had a late afternoon flight, so had a few hours to poke around before I had to head back. With no real targets to look for and wanting to head in the general direction of Baltimore, I went to Lums Pond State Park. This was based on the recommendation of my friend Hal. Of course, that was based on a place for dragonflies, which we both knew were done for the year but I figured it would be a nice spot either way. Arriving at the park, I walked the boardwalk that hosts Blue-faced Meadowhawk and then wandered the other trails a bit. Still very windy, but in a sheltered spot I found a nice mix of sparrows including a Field. 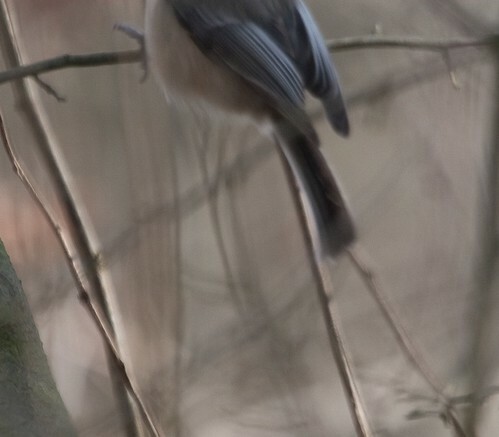 I also more or less managed to finally take a Carolina Chickadee photo. Leaving the park, I still had a bit of time so I plugged parks into the GPS hoping to find a couple more ducks and get my Delaware list over 100. No luck, so I headed to Baltimore. I had planned on walking the bike trail around the airport if I got in early, but given the wind that was out. I parked at the viewing area and zoned out a bit (not sure watching landing planes bounce in the wind was a good idea). Figuring that I’d have to spend some time doing paperwork with the car, I headed back a bit earlier. Other than no free wifi and no food I wanted, the wait wasn’t bad (even with a slight delay). Flight was pretty smooth considering the wind and I was home in time for the Patriots game.